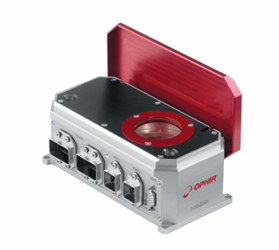 The Helios is a laser power meter designed for the measurement of high-power lasers in industrial processing applications. It measures an array of high-power solid state lasers such as diode, fiber, and YAG lasers with powers ranging from 100 W to 12 kW and energies ranging from 10 J to 10 kJ. The Helios has a convenient, compact design, and it does not require a cooling device when the pulse energy is kept under 10 kJ. Other features for this device include a high damage threshold of over 6kW/cm2, a fast 2s response time, and short 10s wait between pulse measurements. The Helios can be easily integrated into industrial automation networks with its included PC software and PROFINET industrial Ethernet and RS232 serial communications. Download the Helios brochure or check out the video introduction below for more features, specifications, and additional benefits.